Just saw it on eBay. Quite a few airlines. Ordered one just now, hopefully the 717 is soon to follow. Yeah I saw those too- Alitalia, Air Canada (not their prettiest scheme, it's the one with the black/ very dark green? tail), Continental ("United" current scheme) and early Swissair. Very excited about these releases. The MD-87 from EE and Mikromir is great. Looking forward to the MD-95 and the MD-80 due soon too. Quite excited to build one of these kits. Love the whole Dc-9 series! Does anyone know if it's the same plastic as the Fly kit or is it new? If the thread doesn't automatically take you to the post, look for Post 33361 and it will show you pictures of the test shot. EE has been doing all-new CAD work for these kits. Thanks Jodie. It�s obviously not the Fly kit. It looks like the MD11 which to mind mind isn�t good. That kit looks lovely in the box but is an utter pig to build. My unbuilt Airfix DC-9s are safe from eBay for the time being. The Dash-8 on the next page looks promising. I am also eagerly awaiting the Dash-8 (and hoping the aftermarket will bring US Airways final colors for it). 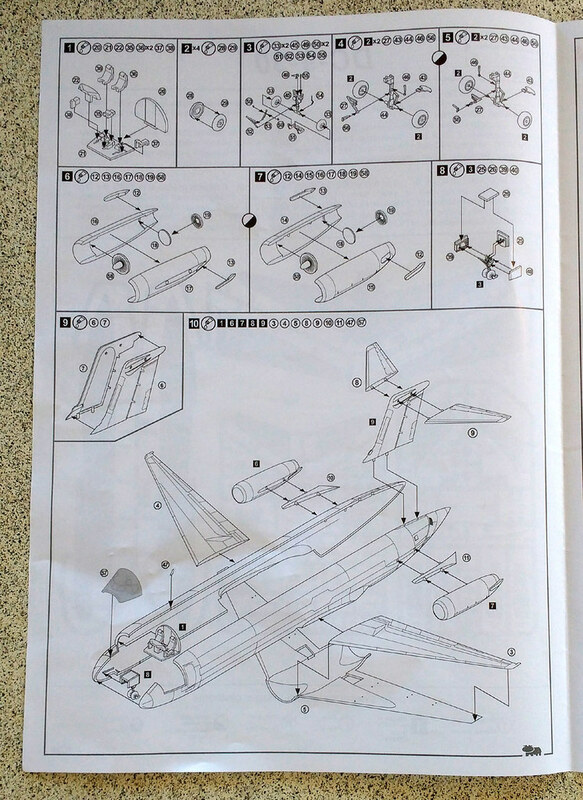 Regarding the quality of the DC-9 kit, I am entertaining the possibility of buying one and posting a comparison to the Airfix and Fly kits, and doing a build report. I'll look forward to that. It will be good to have an impartial comparison. I've never made any secret of my prejudice against Eastern Express which goes back to their early stuff, particularly the A318. The MD11 promised so much (as it should have done at the selling price) but failed to deliver. My partly built example is lurking on top of a book case out of sight pending a decision on whether to try to complete it or junk it and buy Authentic Airliners which I wish I had done from the start. I�ll be eager to hear the comparison to the Fly kit. The Airfix kit is well past retirement age. Nice for its day, but long since eclipsed by technology and expectations. I'll do it. If anybody can route me to a quicker way to get the new EE kit than the current eBay auctions promise (currently showing delivery to me sometime between Dec. 15 and Jan 2), please PM me. Decals don't matter since I have enough decals here to keep me in DC-9s the rest of my life; just interested in the plastic. I don�t care much for the Fly kit. When I opened my first one (only one) and saw the landing gear as an exact copy of the MC MD80. Told me the rest of the kit was probably not worth an effort. Jodie - try Hobby Terra. They�re great to deal with, and ship fast. That said, I�ve had good luck with most of the Ukrainian eBay sellers. The shipping estimate may be due to kit availability. Usually once shipped I�ll have it from UR within five to ten days. I'm a bit surprised that you think the Airfix kit is still better, I can't tell from the sprue shots what the nose is like, and if it has the very distinct DC9 faceted nose which is not present on the Airfix kit, but I can see that it has the fuselage crease line which is such a pain to add to the Airfix kit. If you aim for the very distinct DC9 faceted nose and fuselage crease line you would probably be very happy with this one built by Kurt. Available as -10, -30, -50 series. When comparing EE, Airfix and Fly its probably fair and worthwhile to mention the AA again, its such a sweet kit and even features optional extended flaps. If only I could build them like that one ^^^ I'd be really happy! Jennings, thanks for the tip about HobbyTerra. I am watching the website to wait for the kit's listing. I am also checking eBay daily, as it seems a couple more sellers have the kit available and the prices are starting to find their level. I will close a deal soon on the Eastern Express kit and begin my comparison build, work and other factors permitting. I know the issues with the Airfix kit pretty well but haven't spent enough time with my Fly kit to get a handle on it. I will, of course, be comparing all kits with the various drawings and other material I have here. If you can afford the investment, of course, Kurt Lehmann's kits are the way to go - but as I often remind y'all, they're not within everyone's price range. For me they are kits I can afford exactly one of, if that. I have the Authentic Airliners DC-9-50 with the extended flaps/slats. It is outstanding and worth every penny! I don�t think anyone doubts the quality of Kurt�s kits. Kurt is a true craftsman, and his kits reflect that. However, many people simply can�t afford the prices that Kurt has to get for his hand made, boutique products, so simply saying �Kurt�s is better� isn�t really helpful to many (most) folks. Both have their place. The EE kit sure looks promising. I have had a few happy Airfix DC-9 builds and like the kit a lot. I am looking forward to seeing your build experience with the Fly and EE kits and hearing your opinions about the comparison! I'm still up in the air (ha ha!) on liveries for the comparison build. I have what seems like 17,000 options in my decal stash already and there are so many others available from the various vendors. One will likely be Eastern, since our local airports seemed to always have one around when I was a kid, and my childhood ambition was to fly DC-9s for Eastern. So much for that. But, I digress. The others? So many possibilities, and I'll probably still be trying to decide halfway through the build itself. The Airfix kit is an old friend and I've built several over the years, and with a little attention it can still be built into a perfectly cromulent DC-9. I haven't looked closely at my Fly kit but it does correct a couple things that had bothered me about the Airfix kit. The Eastern Express kit looks like it's covered most of the bases and I'll be interested to see how well it builds. And I have built Kurt's DC-9-50 (as one of the Delta -50s I got to fly on before their retirement), and it is a gem. Yes, too many choices! Eastern will look awesome. I've also got one of Kurt's -50s that I'm going to build as the Last DC-9 I ever flew. Delta ATL-LIT my first year of law school. Can't believe its been so long ago!! With the holidays behind us I have ordered the EE DC-9-30 and should have it in hand soon. I will then be able to do the Airfix/Fly/EE comparison I promised upthread. 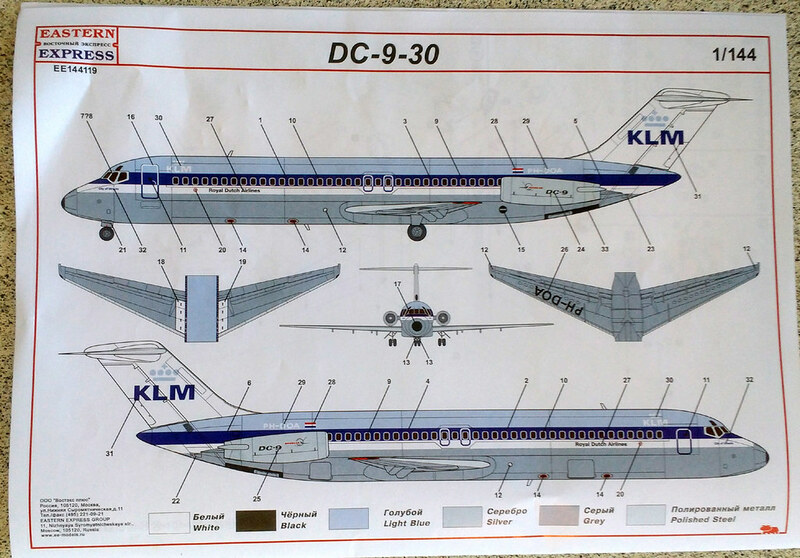 I'll be comparing all three to each other, as well as a couple sets of DC-9 drawings I have. I will probably begin a new thread for the comparison. In the meantime I have begun comparing the Airfix and Fly kits to each other, as well as the drawings, and the results thus far are...interesting. More later when I have all three kits, the time to do what needs to be done, and the time to process my findings. Jodie, if you don't mind me asking, how much did you pay for the EE DC-9-30? In the UK Hannants are advertising it for �44.99 which is around $60 US. The Authentic Airliners kit is �49 (= �43.60 or $58.85 US). I know EE are supposed to have improved their standards recently (although my experience with the MD-11 doesn't altogether bear that out) but I refuse to believe they have improved to the point that they can justify charging more than Authentic Airliners. It may be that the kit is cheaper in the US but on this side of the pond it certainly won't be going on my shopping list. In the UK Hannants are advertising it for �44.99 which is around $60 US. Again, why anyone buys anything from Hannants is utterly beyond my understanding. If you want to pay, in many cases (such as this) several times, more for any given item than what you can buy it for elsewhere, then you should buy from Hannants. Otherwise I can't see any reason ever to do so. There's a seller on eBay out of Illinois who deals in Eastern European/Russian kits who has the KLM issue for $44 US and the other issues for $48 US, including postage. I could have paid less going through a non-US vendor, but I've had good experiences with this vendor and it will get here much more quickly (tracking shows it should be here by Saturday if the weather doesn't interfere). My quick observations are that the mouldings are clean and flash-free. The lobe crease is there although it is a little more subtle than the AZ/Fly kit. EE are definitely improving! Isn't there also a 717 in the works? People buy from Hannants because they are well-known and provide an excellent, reliable service. I wasn't suggesting that anyone should do so, merely quoting their price as part of the reason why I personally won't be buying the EE DC-9. One thing I have noticed, and it is clear in Scott's pics above, is the wing body fairing is incorrect for a -30 and only correct for a -40 or -50. See http://www.airlinercafe.com/page.php?id=396 for an in depth explanation. Ian, thanks for mentioning this EE error, I wasn't aware of these pitfalls. Therefore, I just checked my Authentic Airliners DC9 -10, -20, -30, and -50 and they have all WBFs correct! Thanks to Scott for posting pictures of his kit, and to Ian for pointing out the wing/fuselage fairing issue. It isn't appropriate for a -31/-32 series aircraft, but the -33/-34 series had the -40/-50 fairing. It's kind of irksome since the -33/-34 are comparatively rare, but it does open the possibility for some interesting aircraft (from a quick look around, possibilities include Ozark, TWA, Iberia, KLM, Martinair, Hawaiian, and for those of us interested in Alaskan subjects you could also build one of the DC-9 freighters operated by Everts). They announced it less than a week after I started my PAS Resin kit. They announced their Dash-8-100 not too long after I finished correcting the Welsh kit. I guess it's time for me to start an expensive resin 757 kit, isn't it? Well that's a bummer about the WBF.... Certainly it can't be too hard to get it correct?? While I can't say from experience just yet (as my kit is still en route), it will depend on how thick the molding is. If it's thick enough to work, for a -31/-32 it will require some sanding/filing and artistry (not out of the reach of a reasonably skilled modeler investing a few minutes), while for a -33/-34 the kit fairing is correct. If it isn't thick enough to take that much shaping it'll need to be backfilled with epoxy putty first. That said, in comparing the Airfix kit to two very good sets of DC-9 drawings, Airfix pretty much got it right for the -31/-32 series aircraft, so much that it surprised me. The Airfix kit does have problems - among them no lobe crease, that weird engine pylon split and the soft cockpit shape - but they can be fixed reasonably easily and I will share how I did it with the one I'm working on. The Fly kit is newer, has a lobe crease and a sharper cockpit shape, but the fuselage is in between -30 and -40 length, the engine pylons aren't big enough and the engines sit weird, it has some MD-80 parts in it, and it just seems thick and a little clunky in some places. I should have my EE kit on Saturday, if not tomorrow (tracking shows it at the nearest USPS distribution center), and I will post my impressions soon as I can. I'm sure it won't be super hard to fix but it's a pretty glaring fault that wouldn't have been hard to avoid... Especially on a kit that is close to $50. I had a Fly kit as well as an Airfix kit... My idea was to kit bash and use the both of them to end up with one more accurate finished model. I finally decided it wasn't worth it with the EE kit coming out. I look forward to your review as the Airfix and Fly both had pretty glaring faults. Obviously the AA kit is the best and I have one in the stash (I actually have many of Kurt's kits in waiting) but there are times when I just really want to build a plastic kit! Christian were you ever in any doubt?! Jodie, thanks for listing the operators of the -33/34s. 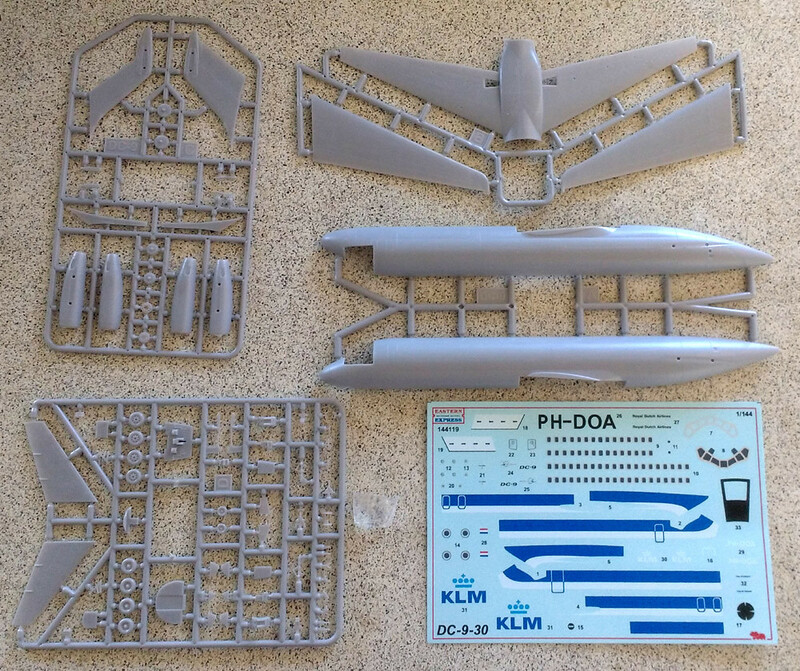 I can still use this kit to build a KLM aircraft and an Iberia too, which is good. I also plan lengthening a couple of fuselages for a Finnair -40 and a Swissair -50 so in all it looks like I'll be buying 4! 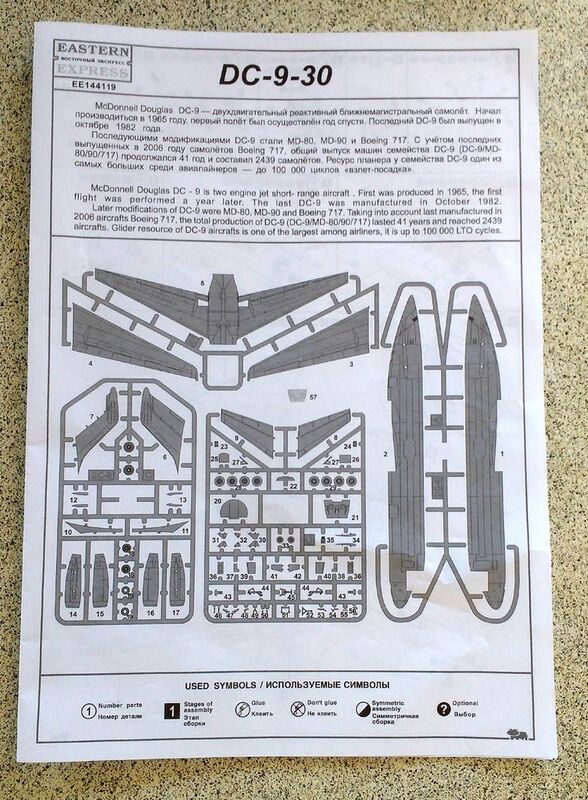 While there's lots to like about what I see in photos of the actual EE DC-9 sprues posted above, aside from the kit's (reportedly) steep pricetag... does a kit the size of a 1/144 DC-9 really need 5 parts (of which 4 are microscopic) for each landing gear strut...plus main gear wheels/tires molded in halves (really!?!? )...and 7 parts for each engine nacelle (excluding pylons)? 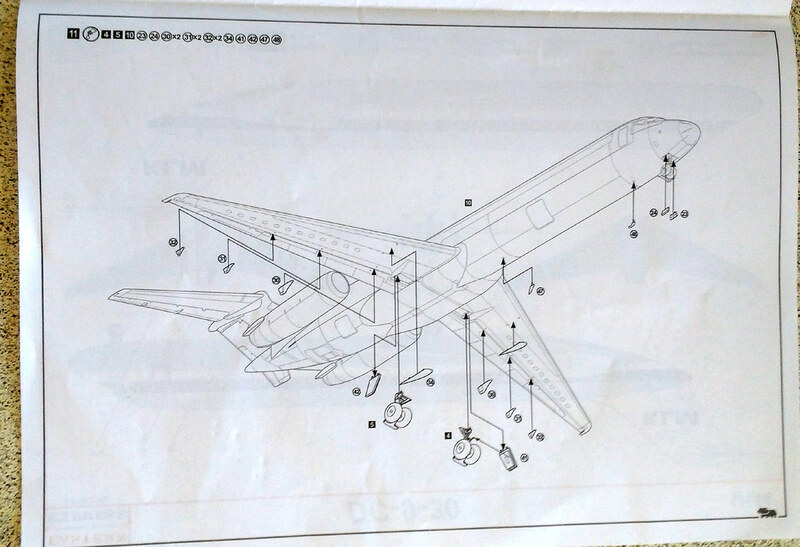 For as painstaking as these parts will be to assemble, will the added detail make it look more like a DC-9 than if EE had kept these assemblies simple ala the Fly and Airfix kits? * As for the cockpit interior that no one will be able to see when the kit has been completed, that area can at least be omitted altogether or assembled partially (perhaps useful as a bulkhead) with relative ease. On the other hand, if the kit were 1/72 scale, we're having a different conversation. In the meantime, my current stash of Airfix and Fly DC-9s will do quite nicely, thankyouverymuch. For the KLM issue you will need to come up with another registration, as PH-DOA was a -32 (KLM's -33RCs were PH-DNM, -DNN, -DNO, -DNP, -DNR, -DNY, -DNZ). Secondary operators included Ozark, TWA (which inherited the OZ aircraft), Adria, Hawaiian, Avioimpex, Evergreen International Airlines, and several others. I know I'm missing a few, but if you scout around on the usual photo sites you can find some prospects. It's sort of a disappointment we didn't get a -31/-32 straight from the kit, but there's still no shortage of neat liveries this kit can wear. I'm also wondering in the back of my mind if the wing/fuselage fairing choice means we could see a -41 or -51 kit. My EE DC-9 kit arrived today and I gave it a quick comparison to the drawings. Fuselage, wings, tail and engine components match up very favorably in dimensions and proportion. Engine pylons may not be long enough on the aft end, but I will base that analysis (and any fix) off more than the quick take I can provide now in between other tasks. The wing carrythrough does appear to be thick enough that anyone who wants to sand/file the belly to -31/-32 spec will have enough material to work with. Overall impression of the kit is favorable, with nicely scribed panel lines and a few details I haven't seen in other kits. I don't know how many of these I'll build, between the cost of this kit and the several Airfix kits in my stash, but I am looking forward to building this one. There's a word one does not often see in kit reviews � or anywhere else, for that matter! The side of the EE DC-9 box shows a Delta B.717, as well as a SAS MD-80 and a JAL MD-11 with P & W engines. Does anyone know of the EE DC-9 has the early horizontally disposed thrust reverser arms, or the later ones where they were rotated toward the fuselage? Indentations on the engine parts indicate they're the rotated cans. The reverser arm fairings are separate parts. My comparison piece on the Airfix, Fly, and EE kits is now complete. I will be posting it as soon as I can troubleshoot an image upload issue. Stay tuned - I think you'll be interested in some of my findings, some of which I didn't see coming.